It is definitely hot and it is still not raining on a daily basis. The summer months are such a challenge for me in the garden since I do not relish the heat and humidity, but I do try to keep up with the basic chores. One chore is scouting the landscape for insect pests that can ruin a good plant sometimes in a matter of days. I am not fond of using chemical pesticides. However, I also do not like to see my favorite plants decline due to pests or diseases. The one pesticide that I keep in my garden shed is Neem oil. This is a broad spectrum pesticide that is also considered a bio-rational product. It is derived from the seed of the Neem tree. 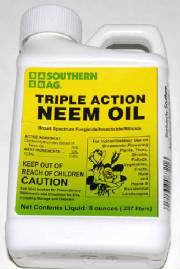 Neem oil functions as an insecticide, a fungicide and a miticide. It does not kill immediately; you must give it time to work. Neem oil has many complex active ingredients similar to the hormones that insects produce. Insects feeding on plants take the Neem oil ingredients into their bodies just like natural hormones. These hormone-like substances block the real hormones from working properly eventually killing the pest. This is especially effective for aphids, mealybugs, white flies, spider mites and thrips. It will also repel grasshoppers, but not kill them. Used as a fungicide, Neem oil works by smothering the fungal spores and is especially good for treating powdery mildew and leaf spots. As oil it will also smother any insect that it covers. Since beneficial insects do not consume the treated plant they are not affected by the hormone disrupting property. But, if the beneficials are covered by the spray they can be smothered. For this reason, it is best to use Neem oil in the early morning or in the evening when beneficial insects are less active. Neem oil is mildly toxic to fish and other aquatic life, so do not use the spray near bodies of water. As with all pesticides, follow the directions on the label carefully. Remember that the Pinellas County Fertilizer Ordinance is in effect from June 1 through September 30. This ordinance bans the use of fertilizers containing Nitrogen and Phosphorus on the landscape during the rainy season to help reduce runoff of these nutrients into our lakes, rivers, bays and the Gulf. You cannot purchase fertilizers containing Nitrogen and Phosphorus during the ban, but there are "Summer Blends" available that contain other nutrients needed for plant growth. This ban does not apply to vegetable gardens or plants in containers. 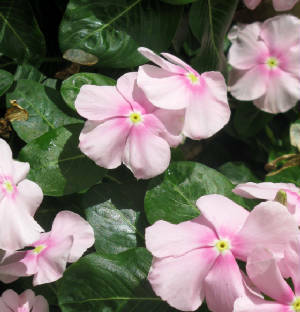 If you are looking for flowers that will stand up to our heat and humidity and that will not be consumed by the deer, two of my favorites are Madagascar periwinkle and either Narrow-leaf or Profusion Zinnia. 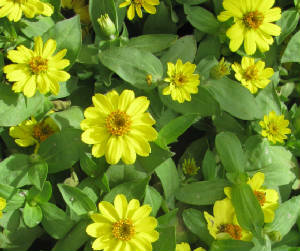 Both of these plants come in lovely colors and are very easy to grow. The last chore that I try to keep up with is weeding. If you let weeds get too big they will go to seed and then you will have multiples of that weed this summer and next as well. It is too hot to use a weed control herbicide on your lawn grass. After the air temperature gets to 85 degrees these herbicides will damage your grass as well. I don't mind pulling weeds in my planting beds and I try to do it early in the morning. Evenings are cooler too, but then you have to contend with mosquitoes. Or, if you are careful, you can spray Roundup on the weeds. Just be cautious that you do not get it on your desirable plants. They can be killed or damaged by Roundup.